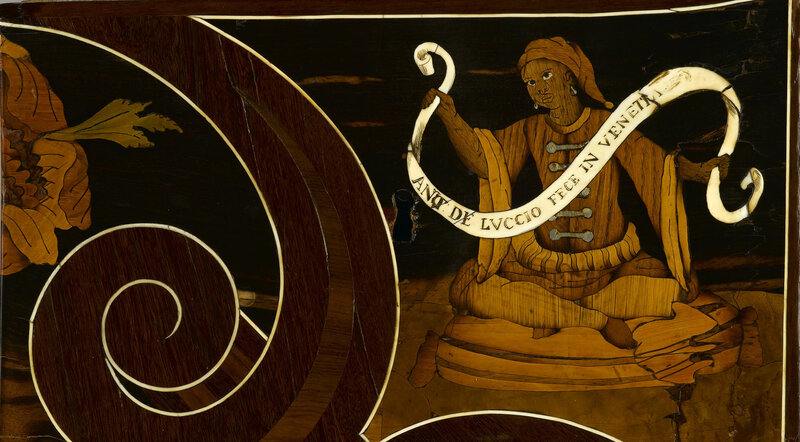 Description: A highly significant and rare German, 18th century, marquetry bureau created with Italian marquetry in ivory, stained horn, ebony, sycamore, rosewood, purplewood, walnut, and pewter by Antonio and Luccio de Lucci of Venice, dated 1686. Inlaid with ivory lines, the rectangular top is centered by an ivory coronet cartouche above a sloping fall of an architectural colonnade with figures in landscapes. There is a scrolling strapwork border amongst panels of scrolling leaves, birds, and insects, enclosing a sliding well and a stepped interior of three short drawers to each side, above two short drawers inlaid with seated blackamoors, one holding a scroll inscribed Ant de Luccio Fece in Venetia 1686 and centered by a hunt scene, above a shaped apron. The sides are similarly inlaid with allegorical figures and battle scenes on cabriole legs. The bureau is attributed to Lamprecht, cabinetmaker from Seehausen, Germany, and was probably made for the wedding of Frederick Auguste, sovereign prince of Anhalt-Zerbst, and princess Fredericke-Auguste-Sophie-Albertine of Anhalt-Bernberg. (The groom’s sister, Sophie Auguste married the future tsar, Pierre III, of Russia, and succeeded him under the name Catherine II.) Frederick Auguste commissioned Lamprecht by giving him the beautiful table by the de Luccis, whose form was no longer in style, to create a new piece of furniture in the latest fashion in Germany. During the 18th century, there was not a great center in Germany for the production of furniture. There were many principalities which were all independent of various sizes. In the most important ones, there was always a cabinetmaker attached to the court. In the larger cities, there could have been several cabinetmakers. The stamp was never used. Those who did sign some of their work did so in ink on the back of the piece or inside a drawer. Little is known about the de Luccis apart from the few signed items that have come to light. As their work is extremely alike, there can be little doubt that Antonio and Luccio de Lucci were related and active in the same workshop. The marquetry by the de Luccis is characterized by bold scrolled ribbons, exuberant floral patterns, and elaborate pictorial scenes as shown in the central panel of this bureau. The inlaid Turkish figures may refer to the defeat of the Turks as the Siege of Vienna in 1683.